Cupcake, my love: Early morning wake up call with White Chocolate Raspberry Brownies!! Early morning wake up call with White Chocolate Raspberry Brownies!! 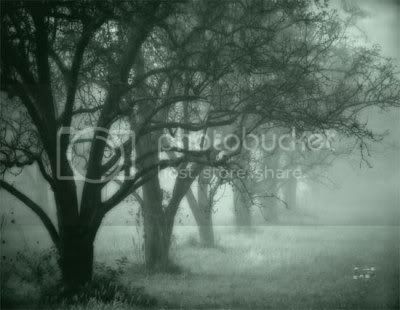 Picture this...It's 5:00 am, the air outside is crisp and cool, yet awakening at the same time. The sun is just beginning to peak over the beautiful Sandia Mountains. One foot in front of the other I'm steadily running my way up a half mile hill. Just as I get to the top, I look around at the mesmerizing city lights that are twinkling like a sea of glittery sequences and I am lost in my morning trance of tranquility...when suddenly this tiny idea shoves it's way through my moment of peace and says "brownies". 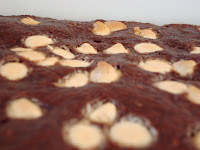 Brownies, hhmm, interesting thought. Suddenly my mind is racing with this idea that, for obvious reasons, is an idea I should entertain! "Brownies, brownies" is all kept thinking for the next 2 miles..."what can I do with brownies?" AAAHHAAA!!! It hit me like a ton of flour :0) I've been wanting to use this boxed brownie mix for a while (just to clear it out of the pantry), so what if I mix that with some raspberry preserves. As I continued my run I'm mentally scanning my pantry and refrigerator for other ingredients. And I think "cream cheese, YES! 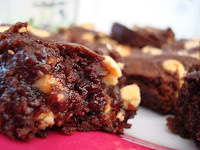 I do think I have cream cheese, so I'll make raspberry cream cheese brownies". Walking through the door, after completing my 7 1/2 mile run, I look at the clock...6:30...Ok I've got an hour and a half to make brownies and get ready for work. On your mark, get set, GO!!! I run to the fridge and come to find out that there's no cream cheese, ok, no biggie, plan b, plan b, what is plan b? Open the freezer and see a bag of white chocolate chips and mini chocolate chips. PERFECT! I mixed up the brownie mix, added a ton of raspberry preserves (didn't measure cuz I was in a hurry, but it was probably 4 big spoonfuls), poured in white and mini chocolate chips and stirred. As I was pouring the batter into the pan, I decided to add more white chocolate chips to the top (Can't ever have enough chocolate). And in to the oven they went. 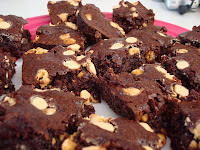 Just before heading out the door, I cut into the brownies, which were still a little gooey (my favorite!) and of course had to give one a try! Can I just say I was in Brownie Heaven! 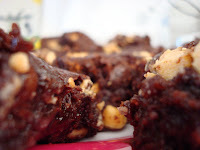 These brownies were a perfect consistency, with just the right amount of raspberry that didn't overpowering the rest of the brownie. Then there was a little bite of the white chocolate which was the most perfect combination for the raspberries. As soon as I walked into work and mentioned I had hot brownies, one would've thought I was giving away a million dollars :0) The little brownies were devoured in no time. I even had a co-worker ask me to marry him because he thought they were that good!!!!!!!!!!!!!!!!!!!!!!!!!! 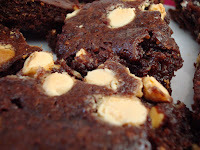 These were probably one of the best, easiest, quickest, most crowd pleasing brownies that I have made. 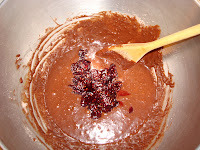 1st off, waking up at 5am is silly, though if it is inspiration for brownies like this, keep up the early morning! 2ndly, these look great. 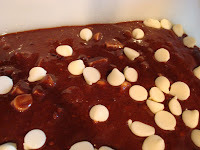 I got a box of 3 ghiradelli brownie mixes at costco, and i may need to use one for this! 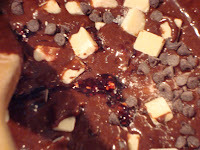 And it already has chocolate chips in it, so it would save me another step. holy cow! marry me! haha i want those brownies! !